ON the arrival of the army at Gien, its leaders were divided in counsel and quarreling bitterly. For the moment, La Trémoille's triumph was complete. He had destroyed the enthusiasm of the nobles and the people, by the truce with Burgundy he had made war impossible, and he had prepared a long series of profitless embassies and negotiations, under cover of which he could misrule France as he pleased. Alençon had been outmanoeuvred in the royal council, and was deprived of his command by the appointment of the count of Clermont as lieutenant-general in his place. Urged by Joan, perhaps, the duke made a last attempt to accomplish something with the force at hand or with a fresh levy of troops. Normandy was the seat of the English power in the north of France. Elsewhere they only held fortresses in a hostile country, but in Normandy they had tried to establish their government with some little measure of success. If their control of the province was disturbed, they would be taken in the rear, and unable to act with vigor against the French elsewhere. The enthusiasm excited by the march on Rheims was felt even in Normandy, and its people, liking the English rule none too well, were encouraged to hope for deliverance. The French partisan leaders were now close to the Norman border, and they were planning surprises of this fortress and that; the whole province was uneasy and ready for a rising. Alençon wished to take advantage of this state of affairs, and to support with a regular army the guerrilla warfare just about to break out. He was ready to undertake the levying of troops, and he asked that Joan might accompany him in his proposed expedition. The request was refused; La Trémoille and his party would not let Alençon become the leader of the French people in their struggle against the English. The duke went in disgust to his estates and stayed there, never again to serve with Joan. The army, which had left Gien in high spirits three months before, was at once disbanded. For several days the court stayed in Gien. At the end of September Charles journeyed toward Selles, while the queen set out from Bourges to meet him there. In her train went Margaret la Touroulde, a reputable woman about forty years old, the wife of an officer of the treasury. Joan had left Gien with Charles, and from Selles she was sent on to stay with Margaret in her house at Bourges. There she passed three weeks, almost constantly in the companionship of her hostess, going with her to confession, to mass, and to matins, sleeping with her often at night, talking freely of her own life since leaving Domremy. Joan's failure before Paris had not shaken her trust in God, her voices, and her mission. That she could have taken Paris, if she had been properly supported, she did not doubt; she had grieved bitterly over the cowardly retreat of the army, but she never wavered in her belief that God had sent her to save France. Her voices no longer directed her plan of campaign, but they were constantly with her, encouraging her in every struggle with the enemy. Thus supported, it is no wonder that she was almost always cheerful and sanguine. She had been disappointed by the failure of Alençon's proposed expedition to Normandy, but this had not been directly commanded by her voices, and when it failed, she wished to fight elsewhere. The council, always vacillating, allowed her to do so. Its choice of the object of attack was quite characteristic. The truces with Burgundy protected all the territory in which the campaign had lately been carried on, while the refusal to allow Alençon to march on Normandy made it impossible to attack that province. Moreover, Charles did not wish to irritate the duke of Burgundy or even the English, since his ambassadors were then at St. Denis with those of England and Burgundy, discussing terms of peace. Neither England nor Burgundy had any intention of making peace, it is true. Even La Trémoille hardly wished it; but be did wish negotiation, and he had to keep up appearances. The council, therefore, was compelled to find an enemy for Joan whom neither England nor Burgundy seriously cared to protect. At the western frontier of the duchy of Burgundy, on the Loire and the Allier, were several fortified towns held by soldiers of fortune. One of these men, Perrinet Grasset or Gressart, had risen high in the world by the skillful exercise of his trade. Originally a mason, he had entered the service of Burgundy and had soon come to the command of a well-disciplined body of cut-throats. In 1423 he made his fortune by the capture from the French of La Charité on the Loire, a strong fortress in which he lived for more than ten years. Nominally subject to the duke, he had plundered Frenchmen and Burgundians with reasonable impartiality, and had constantly refused to observe the truces made from time to time between Charles and Philip. Shortly after his capture of La Charité he had seized La Trémoille, as the favorite was going on an embassy to the duke, and had exacted a large ransom. He had become a terror to the nobles as well as to the common people of Berry, and even to the citizens of Bourges. When Philip sought to keep him within bounds, he was wont to threaten the duke that he would sell out his band and his fortress to some other master. Perrinet Grasset had a niece who was his ward. In 1426 her hand was given to a man after her uncle's own heart. Francis of Surienne, commonly called Francis of Aragon, was a Spanish nobleman of family, uncle of Rodrigo Borgia, who was afterwards Pope Alexander VI. Having come to France to earn his living, he had entered the service of Burgundy, and had been made bailiff of St. Pierre le Moustier, a fortified town about thirty-five miles from La Charité. He had entered into a sort of partnership with Grasset, and supported himself and his followers in Grasset's fashion. For the real purpose of the war, that is, the expulsion of the English, the capture of St. Pierre and La Charité would be almost useless. The French approach to northern France had been so well secured, that these fortresses were not a serious menace to the communications of an army marching from Bourges upon Paris, as they might have been before the campaign just finished. Undoubtedly, their capture would be a great relief to all the people of Berry, and La Trémoille had his old grudge against Grasset. The duke of Burgundy probably cared little whether Grasset kept La Charité or not, and seems to have had no intention of protecting his nominal lieutenants. For these reasons, the council determined to send Joan against the two places. If she were successful, no harm would be done, and La Trémoille would have satisfied his grudge; if she were unsuccessful, her influence would be almost gone, and the favorite would be rid of a danger which threatened his control of France. Some general must accompany Joan, and La Trémoille chose his man with excellent discretion. Charles of Albret was his own half-brother, the head of a great Gascon house, and allied to the blood royal. In early life he had played fast and loose with English and French, then he had attached himself to Charles VII., and by so doing had got a good share of the favors which the king used to distribute among his favorites. He was a faithful follower of La Trémoille, and had sat in the council which voted the truce with Burgundy. Like all men of his station, he had seen a good deal of military service, and he had fought with Joan at Patay. The failure of the attack on Paris had lessened Joan's renown, and Frenchmen no longer looked to her with the devotion they had felt three months before. Her name, however, had still some attraction, and with its help a force was got together before the end of October. In the mean time, she lived at Bourges, and the people of the city, especially the women, tried to gratify the curiosity about her which existed in spite of her diminished reputation. The story got abroad in the town that she was not afraid to fight, because she knew by revelation that she could not be killed. Joan told the people that she had no better chance of safety than the other soldiers. The women used to come to the house of Margaret la Touroulde, bringing their beads and the like, which they begged Joan to touch, as if she had been a saint; but she laughed at them, and said to her hostess, "Do you touch them, and they will be just as good as if I had done it myself." The king had the grace to supply her liberally with money, and she spent it in alms, saying that she was sent for the consolation of the poor and needy. Toward the end of October she left Bourges, and marched with Albret against St. Pierre le Moustier. This town taken by the Burgundians in 1422, was of some little importance, though not very large, and stood about two miles east of the river Allier, at the edge of a bluff rising sharply from the fields which lay between the walls and the river. It was well fortified, with strong towers and a deep moat, and it was held by a sufficient garrison. Francis of Surienne did not command in person, but seems to have trusted the defense to some lieutenant. The army sent with Joan was not a large one, but it invested the place, and vigorously bombarded the walls. After the siege had lasted a week or so, Albret ordered an assault. The troops did their best to storm the place, but failed to accomplish anything, and at length fell back. Aulon, Joan's squire, charged with the care of her person, saw that she remained near the walls with only four or five men about her. Fearing that she would be wounded or taken by a sortie of the garrison, he rode up to her, and asked her impatiently what she was doing there alone, and why she did not fall back with the rest. Deliberately she took off her helmet, and told Aulon that she was not alone, but that she had in her company fifty thousand of her people, and that she would not budge from the spot until she had taken the town. The literal-minded squire looked about him. Whatever she might say, as he afterwards testified, there were not above four or five men with her, an obvious fact known to others beside himself. Again he bade her leave the place and retreat, as the other soldiers had done. For answer she told him to bring hurdles and fagots, so that a way could be made over the ditch to the walls of the town, and then she cried to the troops: "Bring hurdles and fagots, every man of you, and bridge the ditch." This was done, Aulon tells us, to his great surprise, and at once the town was taken by storm without much further resistance. The soldiers, carried away by the fury of the assault, tried to break into the church and pillage it, as they had pillaged the church at Jargeau. But Joan had a great horror of sacrilege; "she manfully forbade it," as a priest who followed her testified, "and never suffered that anything should be carried away from the place." About November 1 St. Pierre le Moustier was thus taken, but its siege had exhausted the French supplies and munitions. Before attacking La Charité, it was necessary to get together a considerable supply of powder, projectiles, arblasts, and the like. Joan went with Albret to Moulins, the most important place in the neighborhood, whence both of them dispatched letters to the cities of central France, setting forth the needs of the army and asking for help. From some cities this help was forthcoming, and the expedition marched against La Charité about November 10. The marshal Boussac, one of the generals who had conducted Joan to the relief of Orleans, now joined the army. Between the fall of St. Pierre and the siege of La Charité, Joan had to undergo a trial inevitable to one in her position. In every province and in every city of France, in almost every hamlet, her story was known. Traveling friars preached sermons in her honor, and the prayers of the church taught that France had been saved by her hand. Might there not be other women who had visions as well as Joan, sent by God to take part in saving the country, or in aiding her to save it? It was certain that women would appear who believed themselves to be thus inspired. 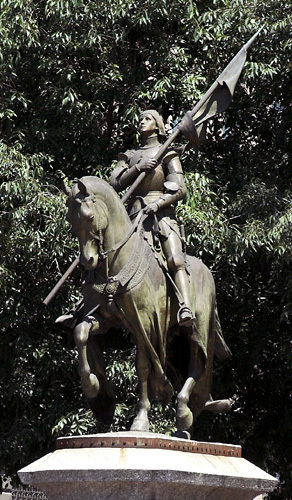 Since the capture of Troyes in July, Friar Richard, the great preacher, had followed Joan. At first this enthusiastic, indiscreet man had given himself up entirely to admiration of her, but her simple common sense had discouraged his rhapsodies, and she had given no sign of enrolling herself among his followers, as many other women had done. He did not desert Joan, but he was ready to discover equal virtue in some other person, and he soon found his chance. At La Rochelle there lived a young married woman, Catherine by name, who gave out that she was visited by a white lady dressed in cloth of gold, and that she was divinely commissioned to go through the cities of France raising money for the payment of Joan's soldiers. She wished the king to give her heralds and trumpeters, who should order all people to bring forth their gold, silver, and treasures, and should proclaim to the disobedient that Catherine knew them well and would find out their goods. Somehow or other this woman reached Berry and met Friar Richard. He did not wish to despise God's messenger a second time, and without hesitation he devoted himself to her cause. Instructed, perhaps, by one of La Trémoille's party, perhaps only catching the drift of opinion at court, Cath- erine talked much of making peace with the duke of Burgundy. The two women were brought together, and Catherine tried to join herself to Joan and so avail herself of Joan's reputation. Joan was shrewd; but to disbelieve Catherine's story without investigation was to doubt the power of God. She asked, accordingly, if the white lady of whom Catherine spoke visited her every evening, and she proposed that they should use the same bed in order that she, too, might see the visitant; to this Catherine agreed. They lay awake until midnight, seeing nothing; then the stout peasant girl could no longer keep her eyes open, but slept until morning. When she awoke she asked if the white lady had come. Catherine said yes, but that Joan was sleeping so soundly that it was impossible to arouse her. Joan asked if the white lady would come the next evening also, and when Catherine replied that she would, Joan, knowing her own weakness, resolved to guard against it, and went to sleep in the daytime. Thus refreshed, she was able to keep awake through the night. No white lady appeared, though Joan often asked if she was not coming, and Catherine always answered, "Yes, very soon." The story is especially interesting, not as proving Catherine's bad faith, which is doubtful, but as showing the healthy physical nature of Joan, whom intense curiosity could not keep awake. The failure of Catherine to do as she had promised was not the only cause of Joan's disbelief in her. The woman's bearing did not commend her, and St. Catherine and St. Margaret, to whom Joan appealed in every case of doubt, told her that the matter was only folly. She wrote to the king to put him on his guard, and when she met him told him the woman amounted to nothing. Catherine herself she advised to go back to her husband and her children. It had become a part of Catherine's plan to visit the duke of Burgundy and urge him to make peace. Joan, who herself had urged him more than once, from her bitter experience answered that it seemed to her that peace would never be found except at the point of the lance. Both Catherine and Friar Richard were much offended with Joan, and the party at court opposed to her were now furnished with a means of discrediting her by setting up a rival prophetess. Catherine, in turn, advised against the expedition to La Charité, which was ready to set out. About November 10 the army marched and sat down before the place. The details of the siege are almost alto- gether unknown. It lasted about a month, during much of which time the town was battered vigorously by the French artillery. There was great want of money and of munitions among the besiegers, and urgent appeal was made, not only to the court, but also to the city of Bourges. As usual, the king and his council did nothing; having refused Alençon's offer to raise troops, having sent Joan on an expedition not of her choosing, the success of which would have done little good, they left the soldiers to starve. Bourges did better; its peo- ple had suffered greatly from the ravages of Grasset's brigands; they saw that "it would be a great pity for the said town and for the whole country of Berry if the siege should be raised," and they sent to the army a considerable sum of money. At last an assault was ordered, apparently by Joan's direction, but it was repulsed with some loss. The money sent by the men of Bourges was spent, Grasset was skillful and wary, the unpaid and ill- fed soldiers became discouraged, and the siege was abandoned in disorder, some of the French artillery falling into Grasset's hands. There were stories abroad that the raising of the siege was not due to the mere neglect of the court properly to support Joan. A chronicler writes that Grasset caused the troops to retire "by marvelous adroitness," and it is not impossible that he dealt directly with Albret or with some other follower of La Trémoille. So ended the campaign in utter failure. Even if La Charité had fallen, nothing of importance would have been accomplished; as it was, not only was there a useless waste of men and guns and ammunition and money, but the power of Joan's name, lessened by the failure before Paris, was almost destroyed. Commissioned to save France, but no longer directed by her voices precisely where to go, she had trusted herself, like a sensible girl, even against her own judgment, to the advice of the captains about her. By them she had been betrayed, or at least abandoned. The only success in the cam- paign, a success as brilliant as any she had ever won, though quite profitless, had been gained by acting against their advice. She was not a general; to the art of war she brought nothing but shrewd common sense, a keen eye for the situation, and a quick sympathy with the moods of her soldiers. Given the full command of an army, very likely she would have failed. What she did and could bring to any honest general of respectable skill was the power to make his soldiers fight as they had never fought, and to fill his enemies with a mysterious dread which paralyzed the bravest of them. This moral power, worth thousands of the best fighting men, the king's council -- for the wretched king had no will of his own -- deliberately threw away.